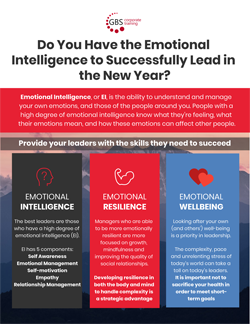 Do You Have the Emotional Intelligence to Successfully Lead in the New Year? Emotional Intelligence, or EI, is the ability to understand and manage your own emotions, and those of the people around you. People with a high degree of emotional intelligence know what they're feeling, what their emotions mean, and how these emotions can affect other people. There has never been an easy time to be a leader in business, but the challenges facing organisations today (from Brexit, to technology disruption, through to increasing customer demands and the 24/7 work cycle) are putting even more pressure on those at the forefront. Business acumen is only one area that leaders need to excel in. How they behave and the strength of their character is just as important, if not more so, than achieving their financial targets. Leaders with a high level of emotional intelligence have the ability to control their emotions and think before acting. Leaders who demonstrate emotional intelligence are motivated by intrinsic and extrinsic values. They are determined to achieve their goals and do not focus on money and prestige. These leaders are especially optimistic during times of change and uncertainty; this motivation allows them to achieve important goals and lead others positively. Great leaders do not ignore the emotions of others. They always show empathy and possess the social skills to build many quality relationships. The best leaders can move flexibly from one leadership style to another to meet the changing needs of an organisation and its employees. Great leaders have the insight to understand when to change their management style and what leadership strategy fits each new business paradigm. How Resilient are your Leaders and Managers? We know the demands of today’s 24/7 digital-first world are not going to change. That’s why building mental and emotional resilience is so important, not just in managing stress but also in developing the capacity to take on more and to lead and partner with others. In turbulent times, it’s easy for leaders to get disconnected from their purpose and what matters in life. Many leaders – people who are supposed to be the role models in businesses – are sacrificing their health, their relationships, and sometimes even their values to meet short-term business goals. The complexity, pace and unrelenting stress of today’s world are therefore taking a toll on leaders – with an increasing number of unexpected departures due to physical health issues, mental and emotional burnout, or poor ethical decisions. And yet too often, people in leadership positions don’t prioritise their own health and well-being. If companies invest more deeply in their leaders as they get to a certain level within their career, then they can improve their overall leadership trajectory. GBS’ Leadership and Management Training will not only provide them with skills for how to lead a business, but also help them understand how to better take care of themselves, how to manage stress and anxiety, and identify other areas of vulnerability that could derail them. Investing in human performance and energy management has demonstrated a proven ROI with strong links to improved market performance realised through decreased sickness absence, all whilst increasing employee engagement and productivity. As a result, business performance improves as well as shareholder value. 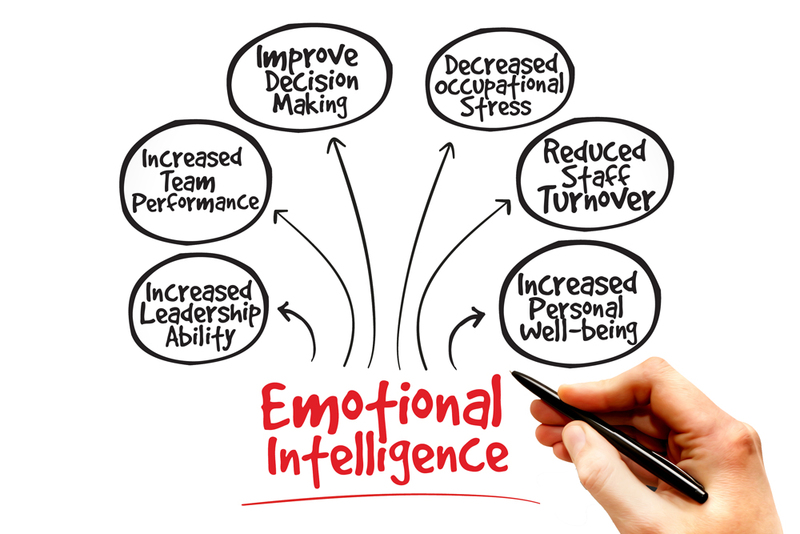 Emotional Intelligence, also known as ‘EI’, was first introduced into the workplace 20 years ago. It has since revolutionised leadership and introduced an entirely new approach to management, encompassing the notion that awareness of emotions is critical to reducing stress. Emotional intelligence is the demonstration of good leadership skills - leaders who are in control of themselves are self-motivated, empathetic and have great social skills. The best leaders are those who have a high degree of emotional intelligence. Daniel Goleman states that “the most effective leaders are all alike in one crucial way: they all have a high degree of what has come to be known as emotional intelligence. It’s not that IQ and technical skills are irrelevant. They do matter, but they are the entry-level requirements for executive positions. My research, along with other recent studies, clearly shows that emotional intelligence is the sine qua non of leadership. Without it, a person can have the best training in the world, an incisive, analytical mind, and an endless supply of smart ideas, but he still won’t make a great leader”. Relationship Management - Relationship management involves your ability to anticipate, understand, and appropriately respond to the emotions of others. It is closely related to empathy. Continual change, increasing demands and the pace of work means that leaders in today’s organisations must not only build new and different capabilities, but actively manage their capacity for exercising leadership. Developing resilience in both the body and the mind to handle complexity is not a luxury, but a strategic advantage. Leaders who demonstrate Emotional Resilience during periods of intense change or uncertainty are able to understand their own emotions as the basis for understanding the emotions of others, and are able to make better decisions for the team. The key is empathy and being able to connect with others in a meaningful way that can boost morale, inspire greater performance, and lay the groundwork for leading with consistency, accountability and integrity. Growing in emotional resilience requires working towards greater self-knowledge. It is important, for example, that you to learn to identify how you react in emotional situations. Becoming aware of how you react when stressed helps you gain better control over those reactions. Managers who are able to be more emotionally intelligent and resilient are more focused on growth, mindfulness and improving the quality of their social relationships. Employees come to the challenge of emotional intelligence with different strengths and weaknesses. Where some find it easy to develop self-awareness and empathy, others have a difficult time, or don't easily recognise the need. Luckily, emotional intelligence (and emotional resilience) is something that can be cultivated and developed. Leaders should develop empathy with their followers. Unfortunately, most leaders follow a dictatorial style and neglect empathy altogether. Due to this, they fail to make a closer connection with their followers. Understanding the problems of your followers and feeling their pain is the first step in becoming an effective leader. Even that is not enough until you work hard and provide your followers with the suitable solution to their problems. Employee engagement comes down to treating your team with respect. In order to treat your team with respect, you have to understand them. Building empathy will help you understand your team and allow you to establish trust. Empathy essentially means ‘putting yourself in the other person's shoes’ or ‘seeing things through someone else's eyes’. There are numerous studies that link empathy with business results. They include studies that correlate empathy with increased sales, with the performance of the best managers of product development teams and with enhanced performance in an increasingly diverse workforce. Empathy relates to our ability to understand another person's thoughts, feelings, reactions, concerns and motives. This means truly making an effort to stop and think for a moment about the other person's perspective in order to begin to understand where they are coming from. Then there is the emotional capacity to care for that person's concern. Caring does not mean that we would always agree with the person, or that we would change our position, but it does mean that we would be in tune with what that person is going through, so that we can respond in a manner that acknowledges their thoughts, feelings or concerns. Empathy requires three things: listening, openness, and understanding. These lead to others feeling comfortable coming to you when they seek advice or feedback. Approachability becomes a huge factor when you are seen as an empathetic leader. Those around you will trust that you will hear their voice, sense their feelings, and provide counsel to help in their specific situation. The ability to motivate your team is one key differentiators of an empathetic leader. Understanding your team, and listening to what matters to them will allow you to provide that unique motivating factor that inspires the best from the individuals on your team. Blending empathy into your leadership style will have a positive impact on your team. Leaders who show more empathy to their team are viewed as better leaders. Situational Leadership® is an adaptive leadership style which encourages leaders to take stock of their team members, weigh up the many variables in their workplace and choose the leadership style that best fits their goals and circumstances. Leaders must be able to move from one leadership style to another to meet the changing needs of an organisation and its employees. These leaders must have the insight to understand when to change their management style and what leadership strategy fits each new paradigm. 70% of Fortune500™ companies consider the Situational Leadership® tool as a critical component of their leadership development strategy. It transcends cultural and generational differences with a success rate that speaks for itself. Situational Leadership® is a proven model of effective leadership that has endured the test of time. GBS Corporate Training provides a series of Situational Leadership® training courses, as part of the corporate training solutions, related to different applications of the model. Book onto our next Situational Leadership® Certification – a three day event designed for trainers to become certified in order to deliver the training within their own organisation – 11th to 13th February 2019, London.